On Sunday, Manchester City will travel to a ground where they have had their fair share of disappointment in the Premier League – Goodison Park. Everton away has typically been a very tough fixture for City, but the Blues have started to enjoy some success in recent years, such as the 3-2 victory in the penultimate game of the 2013/14 title-winning season. Nevertheless, City are in for a tough game on Sunday, and if Everton are at their best, Pep Guardiola may be leaving Goodison disappointed. We caught up with Everton fan Tom Power, in order to get his thoughts on the fixture and his feelings towards the two sides in general. Hi Tom, thanks for joining us. Everton enjoyed a great start under Ronald Koeman but it’s fair to say that the honeymoon period is well and truly over. What’s your take on the Dutchman’s first five months at the helm? Consistently inconsistent. The squad is still getting used to Koeman’s preferred tactical systems, and it will take time for those left from the Martinez era to shake off those bad habits instilled by the Spaniard. Cup exits aside though, 7th place is about as good as expected. Everton strengthened in the summer with the additions of Yannick Bolasie, Idrissa Gueye and Ashley Williams, to name a few. Bolasie has since been ruled out through injury for the foreseeable future. Morgan Schneiderlin has already been brought in this week – do you envisage any more signings in the January window? It would be pleasing to see another one or two come in, yes! Algerian striker Ishak Belfodil from Standard Liege is reportedly close to joining for around £10m but, that aside, I don’t expect much more in the way of incomings. Manchester City have been linked with Ross Barkley, on and off, since he broke onto the scene, but it appears that the Englishman is a fair way off reaching his full potential. Do you agree with this assessment? If yes, why do you think that is? It’s been difficult for him. He’s been lauded as the next best thing to come out of Everton’s academy and, perhaps unfairly, has shouldered a lot of flak on his off-days. He’s got the talent to make it at the highest level, but he definitely needs to start taking games by the scruff of the neck and not feel like he can live off the potential any longer. Are there any future stars in the Everton squad that we may not have heard of? Tom Davies has looked mightily impressive in centre midfield recently. Mason Holgate is another who big things are expected of (he came from Barnsley like John Stones) and Dominic Calvert-Lewin has done exceedingly well to break into the first-team fold in his first five months on Merseyside. What are your perceptions of Manchester City as a club, both past and present? City are – or were! – like us. Passionate fans, living in the shadow of their city rivals. Now that’s obviously changed, with the billions of pounds you’ve invested on and off the pitch. That said, I don’t think there’s any clear aminosity between the clubs, and each wouldn’t mind seeing the other do well. If you could have one player from City join Everton, who would it be and why? Sergio Aguero. He’s just quality isn’t he? We’re in dire need of striking reinforcements so to have a front two of Lukaku and Aguero would be something else! 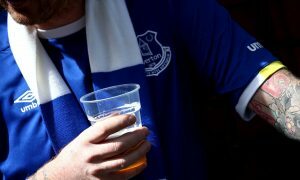 Finally, please can we have your Everton team prediction, and your prediction for the final score on Sunday? Team: Robles; Coleman, Williams, Funes Mori, Baines; Davies, Barry; Valencia, Barkley, Mirallas; Lukaku. Schneiderlin may play a part, but I don’t expect him to start. Prediction: The same scoreline as last time out. 1-1.